“Pace students’ documentation work was very valuable to our outreach efforts and analysis of developments at the UN General Assembly First Committee this year,” said Elizabeth Minor of Article 36, one of the host NGOs. “We were delighted to facilitate their participation and leaning about this international forum, given the vital importance of empowering young people’s involvement in global policymaking and the role of disarmament education in global efforts to address unacceptable weapons,” Minor added. Sydney Korman ’20 and Terrie Soule ’19 were even given the opportunity to address the First Committee, delivering a statement on behalf of nine NGOs calling for greater participation of youth, women, survivors of violence and people from the ‘Global South’ in peace and security policymaking. 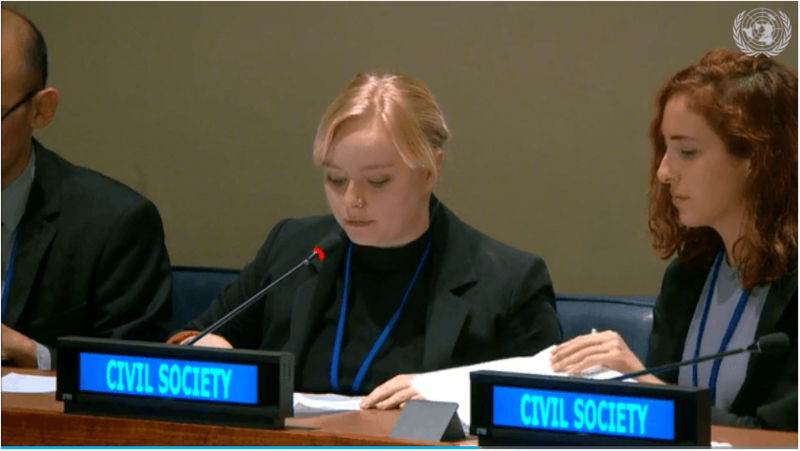 Pace University students Terrie Soule ’19 (left) and Sydney Korman ’20 (right) deliver joint civil society statement on disarmament education to the UN General Assembly First Committee (Disarmament and International Security), 17 October 2018. To read more about – and watch – Terrie and Sydney’s statement, click here. Six students’ (Laken Fornier ’21, Mary-Lynn Hearn ’19, Crystal Isidor ’21, Charlotte Jackson ’19, Dean Tetelman ’19 and Matthew Thomas ’20) assignments were with Peace Boat US, which “works to build a culture of peace around the world by connecting people across borders and creating opportunities for learning, activism and cooperation.” The organization does this through an actual ship that takes people on educational voyages around the world, as well as dedicated advocacy at the UN and in Japan. To read Peace Boat’s article on the Pace students, click here. Peace Boat is on the international steering group of the International Campaign to Abolish Nuclear Weapons (ICAN), which was recognized with the 2017 Nobel Peace Prize award for its successful advocacy for the 2017 Treaty on the Prohibition of Nuclear Weapons (TPNW). The Peace Boat was in the New York Harbor 29-30 October and the Pace students assisted with planning and logistics for diplomatic receptions on the ship, as well as public events at the UN and Rutgers University featuring Sora Tamiko and Tsukamoto Michiko, both hibakusha — survivors of the Hiroshima atomic bombing. “The Peace Boat was much bigger than I imagined! It is a beautiful cruise-liner that is really perfect for the events and programs it hosts around the world. Seeing the boat in person, I was able to see the uniqueness Peace Boat brought to the NGO community,” said Dean. 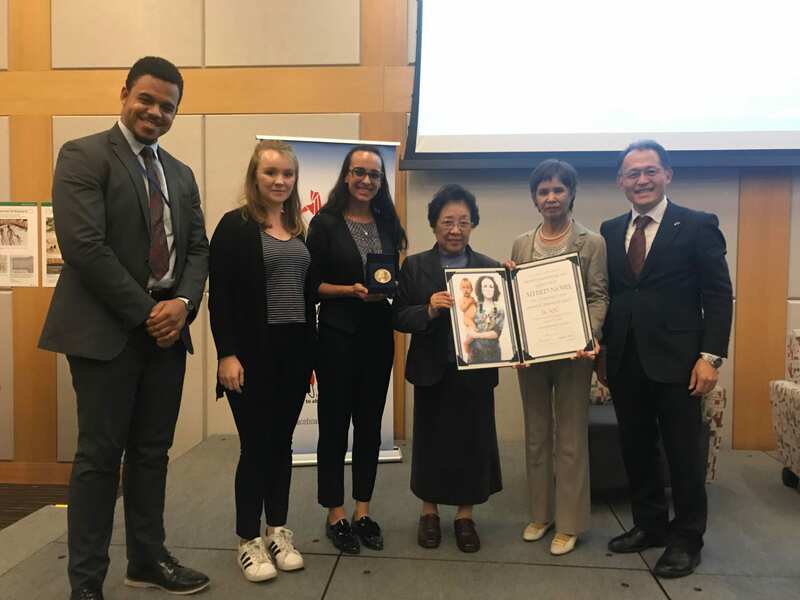 “One of the most rewarding experiences was being able to hear the testimonies of the hibakusha,” said Mary-Lynn. “They expressed no animosity for what happened 70 years ago, only a call to action. Their resilience was inspiring and a true testament to how there is a possibility to rebuild.” Read more of her reflections here. The Global Politics of Disarmament and Arms Control class is offered by the Political Science department on Pace’s New York City campus, taught by the International Disarmament Institute’s director Dr. Matthew Bolton. The service learning assignments accompanied a curriculum studying the politics of how states and non-state actors attempt to manage, mitigate, control and eliminate the risks posed by weapons. The students have all conducted research projects on the humanitarian, human rights and environmental impact of nuclear weapons use and testing. Abigail Elliott ’22, Ally Harasym ’20 and Zuher Ibrahim ’20 worked with another ICAN steering group member, Article 36, taking notes on discussions regarding the TPNW’s provisions on victim assistance and environmental remediation. Article 36 works “to prevent the unintended, unnecessary or unacceptable harm caused by certain weapons.” Students helped with logistics and photography for a lunchtime panel on addressing the harms caused by nuclear testing, co-hosted by Pace’s International Disarmament Institute. Also working on nuclear disarmament was Kathryn Allen ’21, who had assignments with the World Council of Churches (WCC), Veterans for Peace and Peace Action New York. 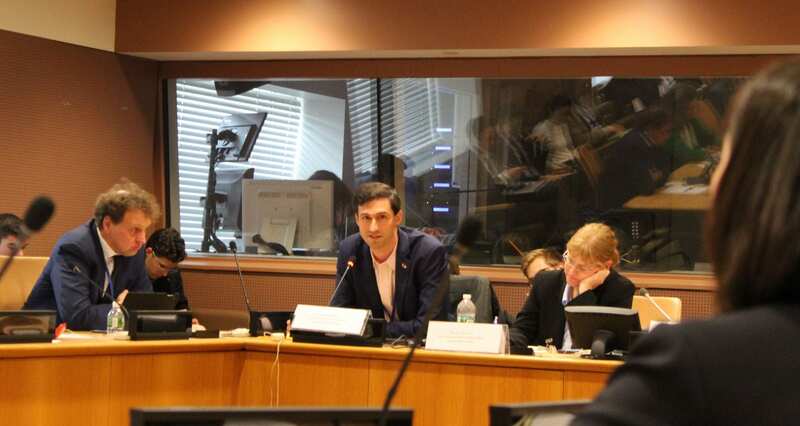 Dr. Matthew Bolton, Director of Pace University’s International Disarmament Institute, talks about victim assistance policies in states affected by nuclear weapons use and testing on a lunchtime side event panel during the UN General Assembly First Committee (Disarmament and International Security), 13 October 2018. Pace University students helped with event planning, logistics and photography for the event. Photo: Zuher Ibrahim ’20. In partnership with Columbia Law School’s Human Rights Institute and Pace’s International Disarmament Institute, Article 36 has also been monitoring the evolving global policy conversation on drones and other remotely-controlled weapons. To help concerned advocates, academics and policymakers, Camryn Conroy ’21, Seneca Forch ’19, Alexis Gonzalez ’21 and Angelica Roman ’19 took notes on any discussion of the humanitarian, human rights or security implications of drones during the First Committee meetings. “Through my time working on my service learning assignment, I have become encouraged that there are individuals devoted to making our world a safer and more responsible place in the realms of weaponry and warfare,” said Camryn. NGOs monitoring and engaging in advocacy at First Committee met for the Humanitarian Disarmament Forum at the UN Church Center, 13-14 October. Several Pace students joined them for the weekend’s workshops, participating in conversations about how weapons challenge progress on peace, sustainable development, gender, indigenous rights and the environment. Carina Draper ’20 and Sydney Tisch ’20 were also taking notes in First Committee, for Reaching Critical Will (RCW). RCW, the disarmament project of the Women’s International League for Peace and Freedom (WILPF), has become a de facto information service for the diplomatic and advocacy communities working on disarmament issues. Carina published articles in RCW’s First Committee Monitor, a newsletter read widely in the UN disarmament community, on the TPNW and nuclear risk reduction. Katherine Ketterer ’20 and Karina Roca ’20 worked with Control Arms, an NGO coalition that works to curb the negative impact of the conventional arms trade. They monitored First Committee meetings for debates on the arms trade, gender and disarmament and the harm caused by the illicit trafficking of small arms and light weapons. To read Katherine’s reflections on her assignment — “A World Free from the Threat of Weapons Is a Completely Achievable Goal” — click here. On 27 November, the students were invited to the UN Secretariat building for a discussion with staff of the UN Office for Disarmament Affairs (UNODA), who spoke about their experiences working in multilateral diplomacy and the complexities of working for a more peaceful and secure world. Pace was recognized in a report by UN Secretary-General António Guterres earlier this year as playing “a globally recognized leading role in disarmament education.” UNODA also published an essay by Dr. Bolton reflecting on Pace’s experience of disarmament education in a recent edited volume. Dr. Bolton and Dr. Emily Welty, director of the Peace and Justice Studies program at Pace, were part of the ICAN team that was recognized with the Nobel Peace Prize in 2017. For a student’s reflection on the Global Politics of Disarmament and Arms Control class in Fall 2016, click here.